Don’s Jewelry opened May 1, 1959 as a jewelry store with full watch, clock and jewelry repairs done on the premises. This is something they continue to do yet today. Donald & Marvel Bartels turned the business over to their son and daughter-in-law Daniel & Sheralyn Bartels. They have 4 children which have all had their turn in the business at some point in time and hope that one day, the 3rd generation will continue on the traditions. 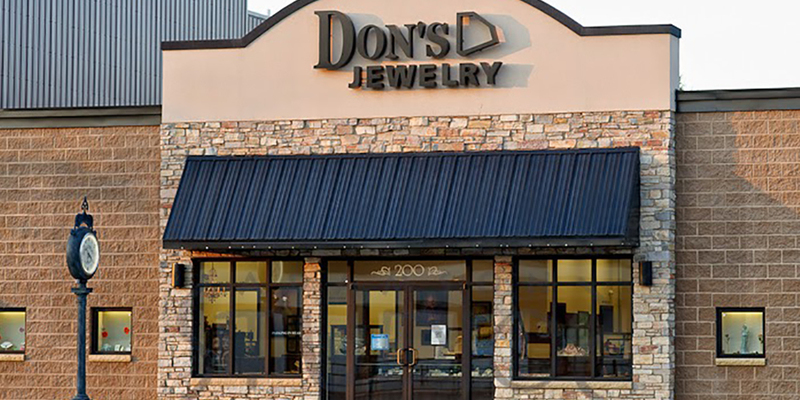 In Spring of 2008 after taking ownership of Don’s Jewelry, Dan and Sheralyn tried to decide whether or not to remodel, move to an existing building, or build a new store. Changes needed to be made to allow more room for the ever growing repair department as well as addressing a parking issue that had existed from day one moving to 119 Main Avenue. After the corner of Main Ave. and 2nd Street had a fire that burned 3 store fronts, the possibility of building a new store started becoming a reality. The “new” Don’s Jewelry broke ground April 17th, 2008 and held a grand opening on May 2nd, 2009 to coincide with their 50th anniversary. There was a line three blocks long that morning, with the first customer arriving at 7am! Don’s Jewelry continues to grow and provide a unique experience for the people of Clinton and surrounding communities. Don’s recently installed computer software to allow the ring of your dreams to be designed right in front of your eyes. Some of the other unique experiences include eyeglass repair done in an hour, car remotes repaired, ears pierced, engraving, bead stringing, jewelry appraisals, and buying scrap gold.